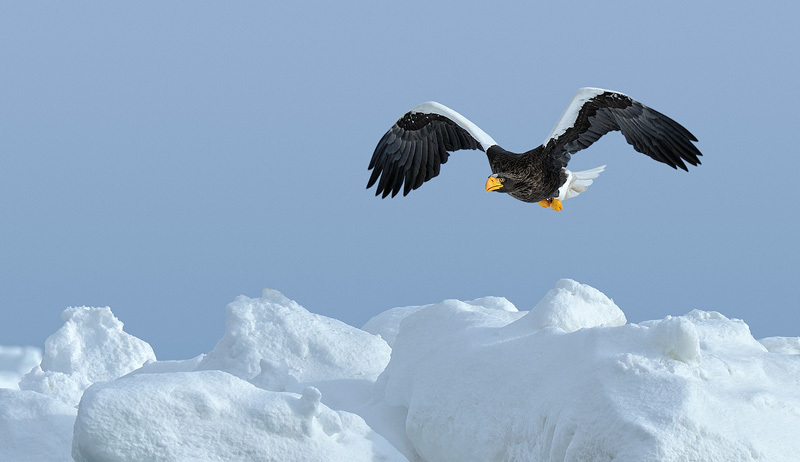 The Steller's sea eagle [Haliaeetus pelagicus] is the biggest bird in the genus Haliaeetus and is one of the largest raptors overall. This species is classified as Vulnerable by the IUCN. The main threats to its survival are habitat alteration, industrial pollution and over-fishing. The current population is estimated at 5,000 and decreasing. Personally, I think they're one of the prettiest raptors on this planet, and this is one of my favorite Steller shots. The floating pack ice worked very nicely as a giant reflector and adds context to the shot, which is often lacking in flight shots.